A Google “doodle” is the decoration Google makes to their logo every so often. Over the years doodles have become one of the most beloved parts of Google. Google doodles have been produced to celebrate several noted artists and scientists. Today, Google announced the winners of the Doodle 4 Google, the second competition where children and students have been invited to work their artistic will upon the Google homepage logo. The national winner is Makenzie Melton from El Dorado Springs, Missouri. She is 9 years old. On the same website, Google presents the history of doodles (the Google logos), the team of designers behind the doodles and an archive of all their event, holiday, official and fan logos. Google’s 2010 Christmas doodle has 17 interactive images that approximate the logo’s letters and colors. Read the story about the creation of this interactive artworks : 5 Artists, 250 hours, 6 months. A tutorial how to program the Christmas 2010 Doodle effect has been published by Martin Angelov on the Tutorialzine website. A Greasemonkey script allows you to put your favorite Google Doodles as a constant image on your Google Search homepage. Another link to install your favorite doodle is available at the Chrome webstore. 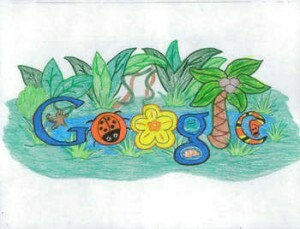 This entry was posted in Visual Art and tagged Doodle, Google, logo by Marco Barnig. Bookmark the permalink.